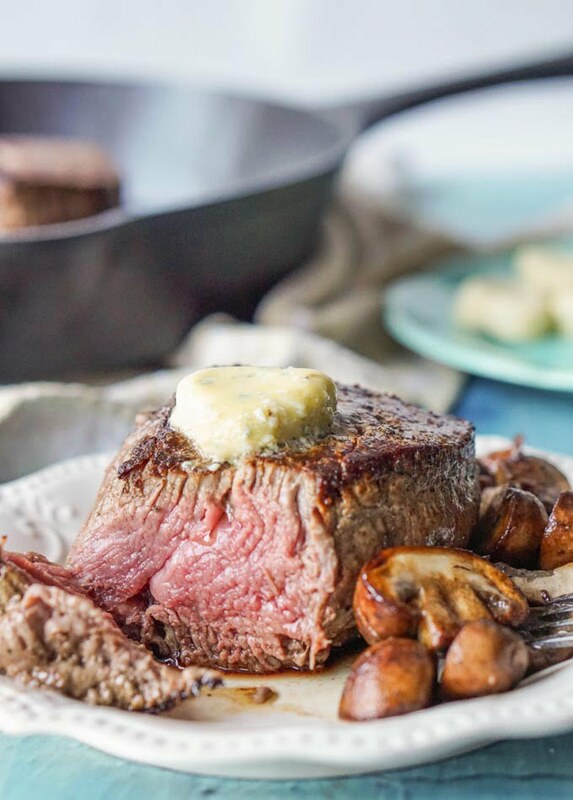 This filet mignon with blue cheese butter makes the perfect low carb Valentine’s day dinner. 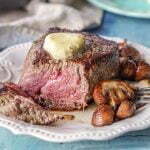 The decadent butter and the tender beef are also very easy to prepare for a special occasion. I like steak but I really, really like filet mignon. Of course I rarely buy it because it is expensive but hey, it’s Valentine’s day. Nothing makes it easier to have a low carb Valentine’s Day than to serve steaks and in this case filet. And to top it off, add some rich and decadent blue cheese butter. Seriously this could be one of my top 5 dinners of all time and best of all it takes very little time. You want to start off with a nice piece of filet. 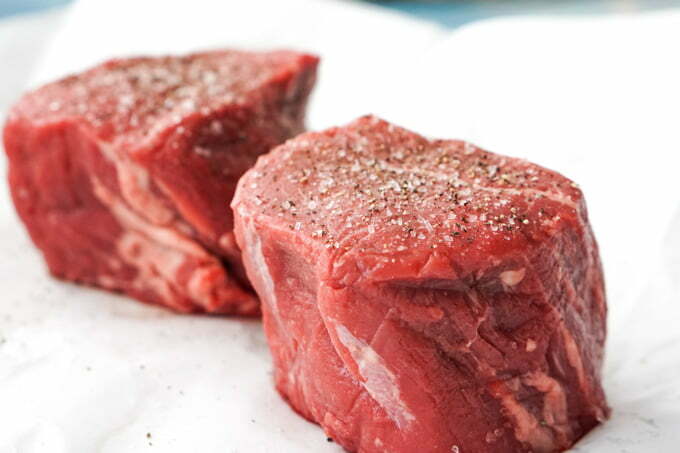 These are 10 – 12 oz each and a good 2 inches thick which is perfect if you want a nice rare piece of steak. If you want to save a little money, you could cut these in half and have thinner steaks and they would be just as delicious. You just wouldn’t cook them as long. Also use a good cast iron skillet to sear the steaks and then finish them off in the oven. I have this one and I love it. First let the meat set out for 30 minutes. Next get your cast iron skillet nice and hot. Add butter and oil to the skillet. Sprinkle salt and pepper over the filets. Sear the steaks on both sides, approximately 3-5 minutes depending on thickness. Place in a 425 degree F oven for 5 minutes. Take out and let set for about 5 -10 minutes. 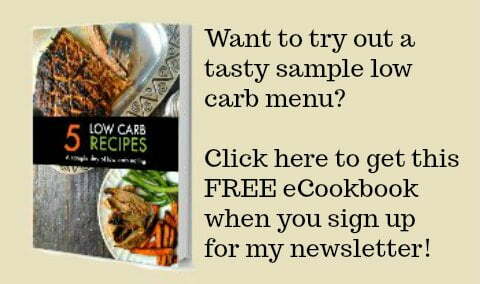 A pat of flavored butter is a great low carb way to make any protein or vegetable delicious. I have a yummy salmon with lemon herb butter recipe that you may like too. Mix your butter with any combination of herbs and spices and then freeze for later use. Just place on a steaming plate of asparagus or broccoli to add lots of flavor. Mix 3 tablespoons of crumbled blue cheese with 4 oz of good butter. Spoon and press into a mold or ice cube tray. Freeze and then store in freezer. Place on steaks, fish, chicken or vegetables. 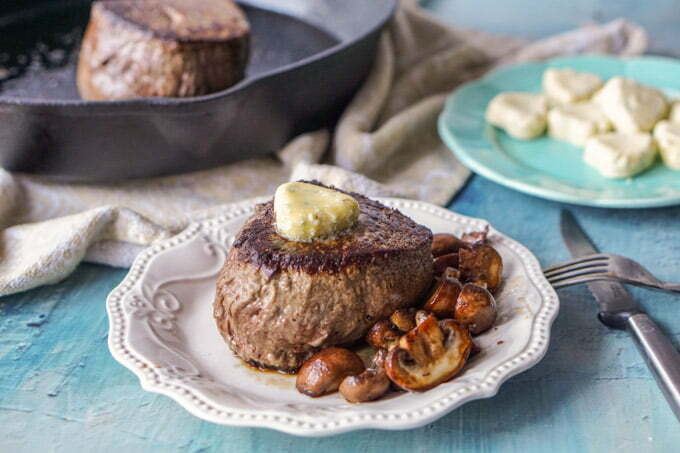 This filet mignon with blue cheese butter makes the perfect low carb Valentine's day dinner. The decadent butter and the tender beef are also very easy to prepare for a special occasion. 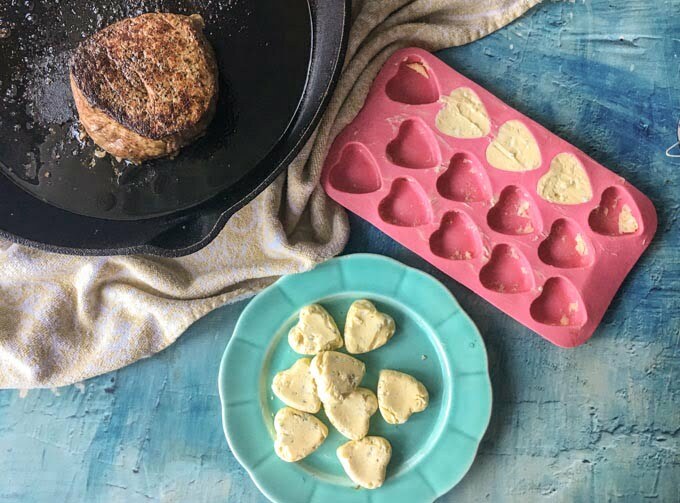 Mix 4 oz butter with blue cheese and spread into a mold or ice cube tray. Can also form a roll and wrap with plastic wrap and cut off pieces. Freeze and then take out of molds and place in a baggie to store in the freezer. Take out and thaw before using. Get a cast Iron skillet really hot and then add 1 tablespoon of oils and 1 tablespoon of butter. Liberally sprinkle salt and pepper on both sides of steaks. Place into hot skillet and brown 3 minutes each side and then place into oven and bake for 5-7 minutes depending on thickness of meat. Place a pat of butter on steak and let stand for 5-10 minutes. This was a last minute decision to make for Valentines Day dinner tonight, and it did not disappoint! I was so nervous, my husband is a bit of a steak snob and this was my first time attempting a filet mignon and he loved it and thought it was cooked perfectly. Thank you for this recipe! So glad you liked it! You made my day so thank you for coming back to comment. Have a great weekend! One of my weakness is meat cooked to perfection – pink and moist on the inside with delicious pan juices on the outside. Love blue cheese so this is my kinda dinner and yes, so perfect for Valentine’s day! We never go out to dinner for Valentine’s Day, except for this year. This year we are actually going to a gourmet cooking class. A professional chef will be guiding couples through cooking a delicious gourmet dinner for two. This recipe is the perfect “at home” special night…..and so much cheaper and more romantic for sure. I’m not a big fan of steaks (I’m full by the second bite lol!) but my spouse is and this would be a wonderful surprise on Valentine. And that blue cheese butter looks and sounds divine. I may borrow your mushroom side idea too! We eat mushrooms like this all the time. Seriously all the time. My family and I love them and they are so simple. My heart is pitter pattering with contentment just looking at the steak and the rest. Your steak is done to perfection, just the way we like it. I love the silicone for the pats of butter. Adorable!! I actually got those molds from the dollar store along time ago! I use them for lots of things. Those photos have my mouth watering. I think I have my Valentine’s meal planned, thanks to you. Now that looks like a dinner I would love to have on Valentine’s Day! Love filet mignon and blue cheese. Saving this for later. Hope you like them Veena!